Want some feedback on your site? As some of your know, we launched our new Community Forum last week (you can register Free here). We wanted to provide a space for you to ask questions and seek feedback not just from Diverse Solutions Staff, but from other members of the Diverse Solutions Client Family as well. Unlike our previous forum on Get Satisfaction that only housed one product, you can now access discussions for ALL THREE of our products on the new Diverse Solutions Community Forum. Swing by the Forum and have a look around. If you have any questions, ask away! If you want some feedback on your site, share it with the rest of us. 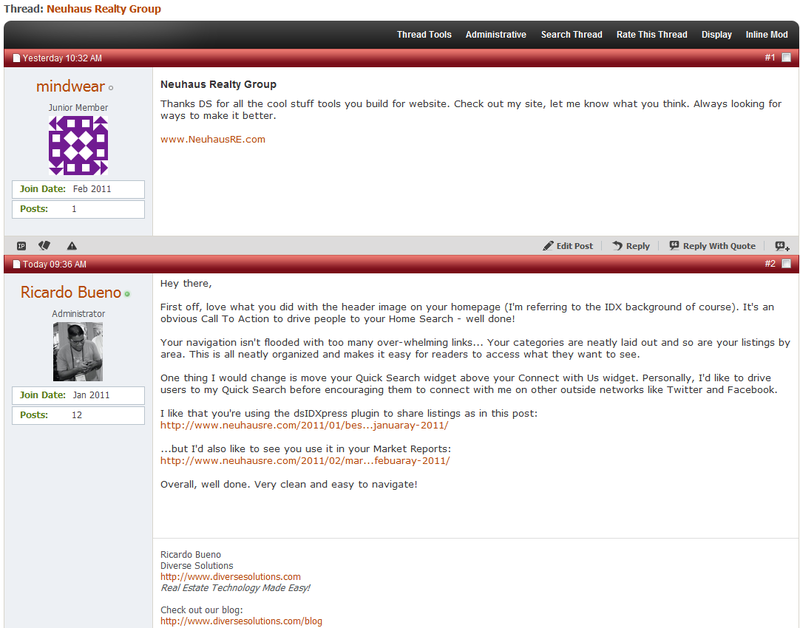 We want to see how you’re using IDX creatively on your site and find ways to help you do better!